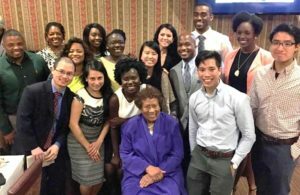 Student National Medical Association (SNMA) is the nation’s oldest and largest independent, student-run organization focused on the needs and concerns of medical students of color. Established in 1964 by medical students from Howard University School of Medicine and Meharry Medical College, the membership includes over 5000 medical students, pre-medical students, residents and physicians. In the fall of 1971 a young medical student, Linda Ann Haynie, received a call from Dr. Patricia Newton, a former UAMS student, informing her about the existence of SNMA. Dr. Linda Haynie Green contacted the organization and established a charter for a local chapter. The first chapter members were Paul Smith, Tommie L. Love, Linda McDade, Sterling B. Williams, Herman Ferrell, Ishmael S. Reid, and Linda Haynie. The group decided to name the chapter after Dr. Edith Irby Jones. Dr. Edith Irby Jones graduated from Knoxville College in 1948 with a Bachelors of Science in biology, chemistry, and physics. Later that year, her acceptance to the UAMS School of Medicine, a segregated medical school, made her an overnight national news sensation. 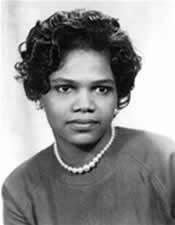 In 1948, she was the first African American to be admitted to and in 1952 to graduate from UAMS School of Medicine. In 1985, she became the first female president of the National Medical Association. Because of the Dr. Jones’ illustrious career and contributions, the UAMS Chapter of the SNMA chose to never forget her efforts by allowing their chapter to bear her name.